Sending a gift message can’t be omitted as the spirit value it brings to the recipient is immeasurable. This is why Magento 2 Gift Card extension by Mageplaza was developed to make this done more easily for both store admins and gift card buyers. Gift messages can be configured in the Gift Card template configuration, Gift Code configuration and Gift Card product page. In this article, this feature will be introduced to you in details. 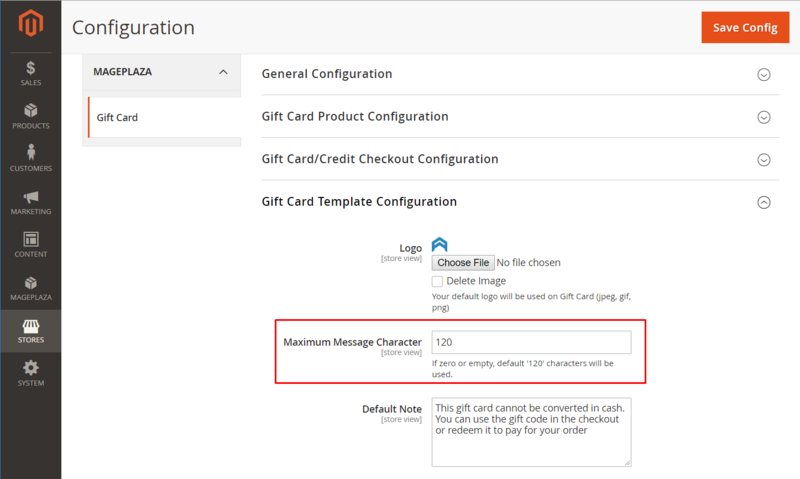 You should define the maximum number of characters allowed in a gift message in the Gift Card Template Configuration first. Go Mageplaza > Gift Card > Configuration > Gift Card Template Configuration. Only by entering a number in the box (as shown in the screenshot below), you will get this all done. 120 is the maximum number of letters that can be used in a message. Remember that if you leave the box empty, the module will understand that you allow that the maximum length of the message is 120 characters. Also, 0 means that up to 120 characters can be used. You are able to allow or disallow gift card buyers to leave a gift message on their gift cards. To enable this feature in the backend is really easy to be done. Go Mageplaza > Gift Card > Manage Templates, from there, you can choose to create a new template or edit an existing one. The gift message configuration part is in Template Information > Design > Design Template. The Drag and Drop feature plays a cool role here, only by moving the blue square named Message from the left to the designing area, you will have the Message box displayed exactly like what you see on the template. To make the appearance of the field more precise, you can customize its size by typing figures in the boxes Width (px) and Height (px) or changing its position by editing the boxes Top (px) and Left (px). Remember that a semicolon (;) should be used to separate values. As default, the line Hope you enjoy this gift card will be displayed on gift card templates. However, it is only visible in backend to be an indicator of how the message will look on the frontend. 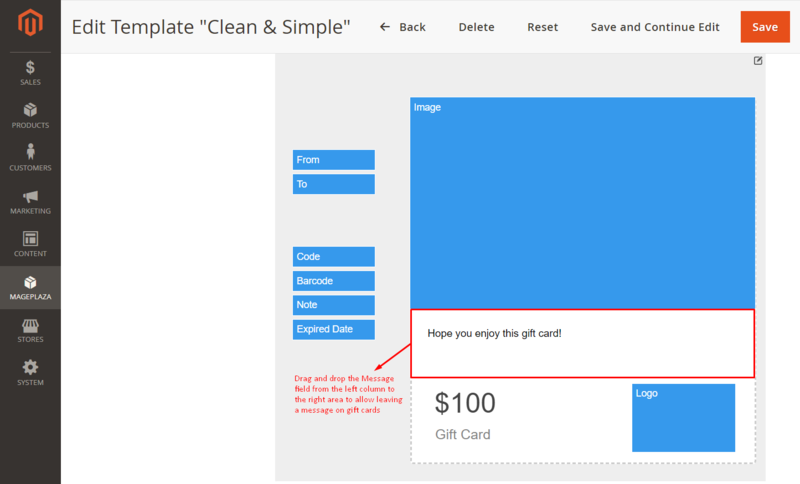 In the frontend, gift card buyers are able to leave a message in a box. Every single letter of the message will appear simultaneously on the card along with the one being typed in the box. Under the box, gift card buyers will see how many letters remaining. All of these features will help optimize shopping experience on your store.